Resistance training is one of the best ways to build lean muscle mass (for shape and tone) quickly, but getting started can be intimidating when you’re new to the whole exercise game. Luckily it doesn’t require a genius to find the perfect resistance training routine—especially not when you follow these tips below. And of course, when you exercise with EFM there’s always a personalised trainer to help you through each workout. Your muscles should already be warmed up when you get to your resistance training. Five minutes of brisk walking, light jogging or another cardio exercise of your choice will help prepare your muscles for strength training and get your mind into exercise mode. Exercising without learning the proper technique first can lead to serious injury, especially when you’re doing strength training. If you’re not yet a member of EFM, you can learn this technique through a couple sessions with a personal trainer or even by watching a few Youtube videos. The same way everybody has a smaller foot and a larger foot, most people have stronger muscles on one side than the other. Performing exercises that isolate the muscles on one side of your body can help you address these imbalances because it forces your body to use the muscles equally rather than relying on the stronger muscles to give the desired effect. The phrases “resistance training” and “strength training” might conjure to mind images of massive dumbbell sets and barbells but there are actually several other types of equipment you can use for strength training. Resistance bands, kettlebells and medicine balls can all be used for strength training both in your home and at the gym. Your local EFM club will offer plenty of variety in all facets of exercise, but if you’re training alone, don’t be shy to mix things up a little! Knowing how much weight you can handle for different exercises requires some experimentation. Start with a weight that’s a little bit lighter than what you think you can handle to be on the safe side—overestimating yourself can lead to quick injury. If you’re doing sets of 12 reps each your muscles should be somewhat tired by the time you start the third set and completely exhausted by the end of that set if you’re just starting out. If you’re able to power through a third set you need to up your weight; if you can’t make it through the third set you need to lower it. Once your body gets used to a specific type of exercise it starts to lose its effectiveness and you need to either start doing a different exercise or increase the weight you’re using. Adding new things to your routine also helps keep you interested. You can change up your routine with new equipment, new exercises or a new strength training class. Make sure you change your routine regularly for best results. Your muscles need at least 24 hours between strength training workouts to recover and grow stronger. At the end of a workout your muscles should be sore but pain at any point is a sign that you need to stop working out and give your body a rest. Make a point of scheduling non-workout days and relaxation time. Strength training doesn’t have to be complicated. If you follow these 7 tips you will be well on your way to increased strength, shape and tone. Of course, if you’re looking for a little guidance with your workouts, EFM personalised training is a fantastic high-service option to consider! 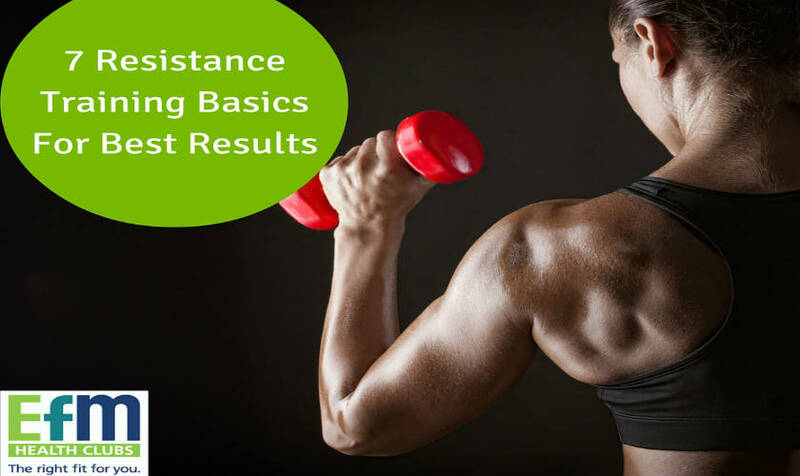 Does Resistance Training Help With Weight Loss?